Although officially Google’s augmented reality personal computer Google Glass is not yet on sale in Russia, there is a growing number of pictures on Russian social networking sites of users sporting the famous "smart" glasses. How do Russians manage to get their hands on the coveted gadget and what do they do with it? Find out in an exclusive RBTH report. Just ten years ago, if you had told somebody that by 2014 they would be able to purchase a set of futuristic “smart” glasses that allow the wearer to see digital information superimposed upon reality and communicate with the internet via voice commands, they would have laughed in your face. Yet the arrival in 2013 of Google’s pioneering augmented reality computer headset, Google Glass, has brought this fanciful dream to life. Although officially Google Glass is not available for sale in Russia, this is not a problem for people who travel a lot – testified to by the growing number of pictures on Russian social networking sites of users sporting the famous "smart" glasses, with captions saying: "At last, I am testing Google Glass!" "I bought Google Glass in America, simply having registered as an Explorer,” says Igor Barinov, a startup entrepreneur and CEO of the company Hint Solutions. “Buying the glasses turned out to be not such a difficult thing to do; I just signed the standard papers and an NDA [non-disclosure agreement]." Until recently, Russian users were very cautious about wearing Google Glass in public as it was believed that, under Russian law, it was a potential spy gadget. However, in October 2013, in comments for a Russian blog writing about Google Glass, the Russian Federal Security Service (FSB) officially denied this. Google Glass became available in Russian online shops right after it began to be sold to selected users in the U.S. Russian sellers must have acquired the glasses from acquaintances who had a U.S. social security number and who had applied for the Google Explorer Program, although RBTH has not been able to conclusively verify this assumption. In any event, prices for Google Glass in Russian online stores have dropped from the initial $10,000 (350,000 rubles) to the current $2,100 (74,000 rubles). Google itself has always sold the gadget to customers on a waiting list for $1,500. Incidentally, at some point there were ads on the Russian classified ads site, Avito.ru, selling coupons with a place on this virtual waiting list. However, owing to its large price tag and relative novelty, Google Glass poses something of a challenge for online retailers. "The problem [with Google Glass] is that it is quite an expensive gadget and it makes more sense to work with pre-orders rather than buy it in batches," the owner of a large internet store, who has asked to remain anonymous, told RBTH. 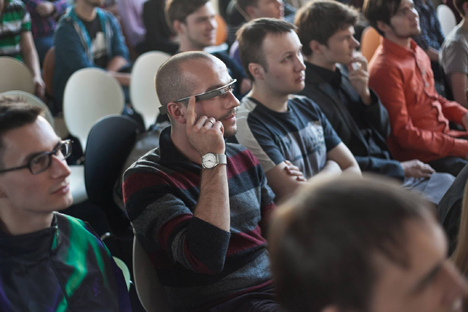 RBTH was able to talk to a number of people in Russia who own the device: All say that at present Google Glass is poorly adapted for Russian users: Its interface and software are available only in English, and the same goes for its voice activation function (which is one of the device's key attractions). The option to search in Cyrillic with the use of voice commands, not only in search engines but also in navigation or search for a contact, is not available either. Yet Google Glass has other uses too. These primarily include taking pictures, recording video and instantly uploading the results to social networks, as well as instantly checking email and other notifications. The glasses are also becoming an important social tool. "Google Glass helps me to establish new contacts,” says Igor Barinov. “First people are intrigued by the gadget and, after you have let them try it on and explained how it works, it becomes much easier to break the ice with a person you would like to meet." "I want to use Google Glass to take a peek into the future,” says Grigory Petrov, a technology evangelist with Digital October. “Besides, the glasses attract a lot of attention at all industry conferences." Petrov wears his "smart" glasses only at events where the audience have heard of this gadget: He says that wearing it on the subway or in the street would be odd. "It is a gadget not just from the future but also for the future. It is yet to reveal its full potential," says Hi-Tech Mail.ru editor Alexander Baulin. He explains that for the time being Google Glass is best of all used for navigation, taking pictures or recording video but the full spectrum of its capabilities will, of course, become clear after the device gets a license in Russia and is adapted for the Russian language. All Google Glass users polled by RBTH agree that at the moment this gadget is more of a toy for techno geeks than an essential device for everyday life. Even Google admits that its new product is just a pilot. Baulin is convinced that further modifications to Google Glass will target both the device itself (increasing its battery life, developing an effective cooling system, making improvements to the screen) and its software. In particular, we can expect to see new additions to its library of applications that develop new scenarios for using the "smart" glasses and expand the existing ones.